By the time Benazir Bhutto met her death at the hands of a suicide bomber in 2007, she and her niece Fatima hadn’t spoken in over a decade. Still, people loved to compare them. From the length of their noses to their western educations and even on to their shared love for sugared chestnuts and candied apples, there existed an undeniable bond between the two women. Fatima acknowledged it in a column where she mourned her aunt’s passing, addressing Benazir as ‘Wadi Bua’ – Sindhi for ‘father’s older sister.’ “…I have yet to bury a loved one who has died from natural causes. Four. That’s the number of family members, immediate family members, whom we have laid to rest, all victims of senseless, senseless killing,” she wrote. But grief did not change the fact that Fatima harboured a profound contempt for Benazir’s politics. Though the latter had succeeded in becoming an Islamic nation’s first female Prime Minister (she went on to a second term) Benazir had done little to curb rampant corruption or to instigate the social reform. Instead she had made her husband Asif Ali Zardari, a man so corrupt that he was known as Mr. 10%, Federal Minister of Investments. “Zardari was Mr. 10% in Benazir’s first term, and then he was Mr. 50% in her second, now he’s Mr. Pakistan. He runs the country like a business,” says Fatima of Pakistan’s current President. Though barely 28, Fatima has long been one of the government’s most outspoken critics and an internationally published journalist. When Benazir hit the campaign trail for the third time in 2007, Fatima launched her own campaign. Through columns and articles she drew attention to the thousands of deaths and disappearances that Benazir’s government had presided over. But above all, she remained locked in a struggle to bring justice to those who orchestrated the murder of her beloved father, Murtaza Bhutto – and she believed she need look no further than the former First Couple. The events that led up to this moment, to this confrontation between these two singular women, were inextricably caught up with several decades of bloody Pakistani politics. The Bhutto dynasty is synonymous with the Pakistan People’s Party (PPP) – easily the country’s most influential political party. It was founded by Fatima’s grandfather, Zulfikar Ali Bhutto, who assumed the role of President in 1971 and then followed it with that of Prime Minister in’73. Accused of a politically motivated murder, he was executed after a coup d’état brought General Muhammad Zia-ul-Haq into power. Benazir still had hopes for a political solution. Her brothers, in exile, chose differently. Murtaza and Shahnawaz founded the militant outfit Al-Zulfikar. Several failed assassination attempts on General Zia-ul-Haq and one notorious hi-jacking followed. Still, they made lives for themselves in exile. Murtaza married Fauzia Fasihudin, the beautiful daughter of a senior Afghan official. Fatima was their only child. In the summer of 1985, the beleaguered family found a brief respite, reuniting in Cannes. Benazir savoured the company of her brothers and enjoyed watching young women swoon over a gloriously handsome Shahnawaz. But the world could not be kept at bay – they woke one morning to find Shahnawaz poisoned. His wife and Fauzia’s sister, Rehana was suspect. When she sided with her sister, Fauzia’s marriage fell apart and Murtaza left for Damascus with a 3 year old Fatima. But here, at last, was peace. Father and daughter lived in a two bedroom apartment. Having abandoned militancy, Murtaza cooked and cleaned for his daughter. “We had a little bit of a bachelor life in exile – there were the two of us, eating omelettes for lunch and driving around when we couldn’t sleep at night,” Fatima recalls That year, Murtaza met and married Ghinwa Itaoui, a Lebanese teacher. The two would have a son together – Zulfikar Ali Bhutto Jr. When Fatima turned 11, Murtaza decided to return to Pakistan and begin a legitimate political career. But with 90 cases pending against him, he was arrested on the tarmac. It was the start of an ordeal. “For me, Pakistan was a kind of mythical, romantic country which was the translation of my father’s dreams and loves.” Reality was instead a 45 hour long journey to visit Murtaza in jail every week. They saw even less of Benazir, now Prime Minister. In ’92 Benazir launched Operation Clean-Up – the brutal campaign was intended to wipe out any opposition. His open criticism of her policies led to her brother being counted among them. On a cold night in 1996, Murtaza was killed in a police “shoot out.” Just down the street, Fatima and her six year old brother cowered in a windowless dressing room. Afterwards, a tribunal headed by a respected judge of the Supreme Court would come to the conclusion that there had been no shoot out – instead it was a massacre authorized at the highest levels of government. Still, no action was taken. Year later, Fatima would write, “When I was fourteen, my life was ended. I lost my heart and soul, my father Murtaza.” But the moment decided something else for her – she would not be silent, but neither would she join the dynasty. Her father had envisioned a different life for her, in which she would realise her ambition of becoming a journalist. That very year she published a book of poems, ‘Whispers of the Desert’ and dedicated it to Murtaza. With Ghinwa to care for her, Fatima set about the business of growing up. She enrolled in Columbia University to study to study Middle Eastern politics and then completed her Masters at the University of London. 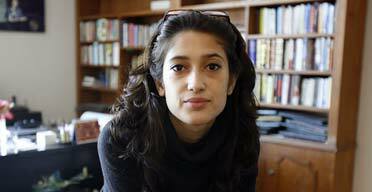 In her early twenties, in addition to her journalism, she would publish ‘8.50 a.m. 8 October 2005,’ a book that would give voice to the young survivors of the Pakistan’s now infamous earthquake. But she would save her scathing commentary for the government, sharpening her pen on laws like The National Reconciliation Ordinance (NRO) which allows politicians like Zardari amnesty from their crimes. It was the same law that allowed Benazir to return to Pakistan…and to her death. Still, occasionally, she finds herself wondering how long it will be before something bad happens again. She spent hours as a child absorbed in calculations until she came to the conclusion that her family were trapped in a vicious cycle – the Bhuttos typically enjoyed approximately 10 years of comparative peace between ‘incidents.’ But she draws comfort from something Ghinwa once told her – “we live the way we do and we raised you the way we did, to break that pattern.” In the end, with Benazir’s children settling into the political lives of their forebears, it is left to Fatima and Zulfikar to make a different choice – “this isn’t a political factory,” she says firmly. Though her choice might dilute the political influence of this great Asian dynasty, for Fatima, it’s about time for a change. Published in The Sunday Times, Sri Lanka on November 8, 2009. Words by Smriti Daniel. Tags: Asif Ali Zardari, BenazirBhutto, Fatima, Murtaza Bhutto, Pakistan, Zulfikar Ali Bhutto. Bookmark the permalink.